This personalized cat laser etched hardwood photo frame features various cat motifs around the frame with kitty's name laser etched across the bottom. This hardwood cat photo frame is available in 3 sizes, 4x6, 5x7 and 8 x 10 sizes. 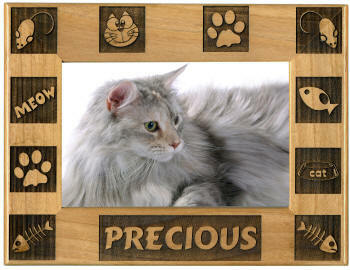 This engraved wood cat frame is a special way to display a photo of your beloved cat.